Russian engraver; born at Wilna 1852; educated at the Wilna rabbinical school; graduated from the Wilna School of Designs in 1869, and from the St. Petersburg Academy of Fine Arts in 1876, when he was appointed engraver to the Imperial Mint. He became a noted medalist. 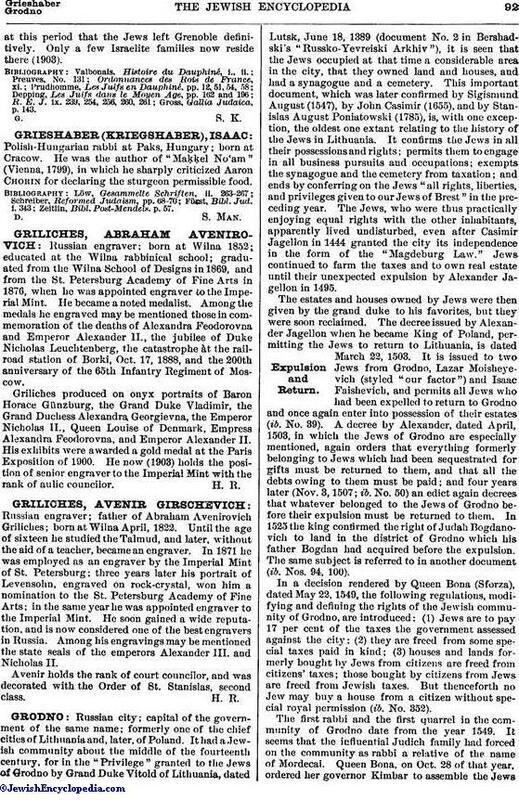 Among the medals he engraved may be mentioned those in commemoration of the deaths of Alexandra Feodorovna and Emperor Alexander II., the jubilee of Duke Nicholas Leuchtenberg, the catastrophe àt the railroad station of Borki, Oct. 17, 1888, and the 200th anniversary of the 65th Infantry Regiment of Moscow. Griliches produced on onyx portraits of Baron Horace Günzburg, the Grand Duke Vladimir, the Grand Duchess Alexandra, Georgievna, the Emperor Nicholas II., Queen Louise of Denmark, Empress Alexandra Feodorovna, and Emperor Alexander II. His exhibits were awarded a gold medal at the Paris Exposition of 1900. He now (1903) holds the position of senior engraver to the Imperial Mint with the rank of aulic councilor.